When it comes to dogs, few are larger, fluffier or cuter than the Great Pyrenees. If you’ve got one, you’ve probably spent many an afternoon playing, fetching and snuggling with such a dynamic, attentive and friendly pup. When you’ve got such a good best friend, you want to treat them with the respect and love they deserve, which means making sure they’re given proper nutrition – this comes from picking the best dog food for your Great Pyrenees. Check out our comprehensive guide! How Many Calories Does a Great Pyrenese Need? Great Pyrenees are some big ol’ dogs – the males can grow up to 120 pounds, while females grow up to about 80-90 pounds! As such, you’ll need to make sure they get a lot of caloric energy so they can sustain their weight. 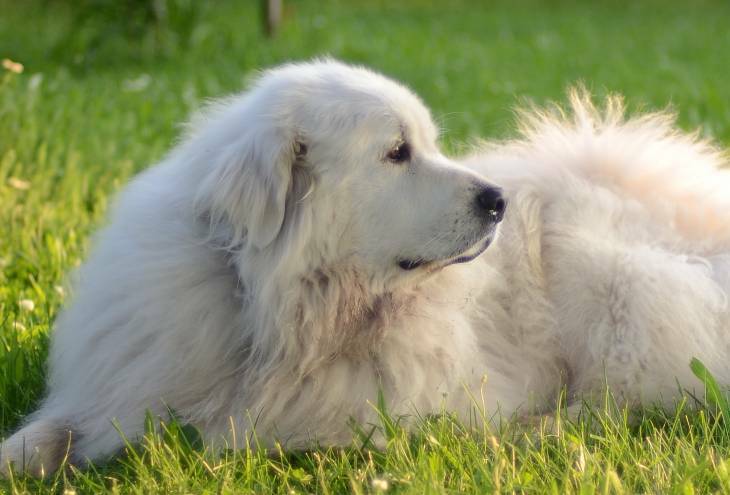 While Great Pyrenees are known for being big nappers and slightly more sedentary than many other large breed dogs of their size, they still need quite a bit to stay healthy. If your dog is somewhat older and more inactive, we’d suggest getting them about 1750 kcal/day. A normal Great Pyrenees, though, can handle a diet of about 2138 kcal/day. If you’ve got one of those rare Pyrenees that just can’t stop moving and is more active than normal, you can increase their calorie intake to 3402 kcal/day. This video on Great Pyrenees is a fantastic overview of the kind of things you need to consider when owning such a fluffy large breed dog. This includes their history as sheepdogs, their sleepy nature, and some helpful grooming and feeding tips. Surprisingly enough, Great Pyrenees have a relatively moderate appetite for being such giant dogs, which means you might not be feeding them as much as you need to for other breeds of similar sizes. This is partly due to their relative lack of activity, as they are more prone to napping than other big dogs. Still, no matter what, you need to make sure they’ve got a proper, well-balanced diet full of high-quality food that will give them a shiny coat and keep them healthy. The Great Pyrenees’ coat is its crowning glory; long and luxurious, you want to make sure that you maintain its good health so your Pyr can keep looking and feeling fantastic. To that end, a dog food high in omega-3 and omega-6 fatty acids and other kinds of healthy fats are important – they’ll really help toward that end. Great Pyrenees will also often have problems with plaque and gingivitis, which means that you’ll want to cut down on some other kinds of commercial dry feed that has more sugar than usual. Cancer. Osteosarcoma (bone cancer) is common in Great Pyrenees, as are reproductive cancers. Make sure your dog is healthy, active and is getting their full nutrition. Hip dysplasia. Make sure your dog’s diet has plenty of calcium to maintain strong bones. Overactive coat. Great Pyrenees shed more often than normal; give them a slightly fattier diet to maintain their shiny coat. Heart disease. Great Pyrenees can often encounter heart disease; therefore, make sure to not go overboard on the fat content in their diet. Mange. It’s important that you feet your dog an incredibly well-balanced diet with plenty of vitamins and minerals to prevent mange. Hypothyroidism. High salt content can lead to these kinds of problems in dogs, so make sure your dog’s diet is not too packed with sodium. 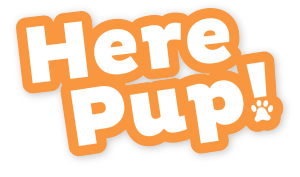 Since your Great Pyrenees will grow up to be a big ol’ dog, there’s a bit more care you have to take in their feeding if you’ve got one from puppyhood – the difference in sizes will be much more dramatic than in other dogs. Generally, when they’re a puppy (less than 18 months of age), most breeders won’t give them to a new home until about 8 weeks in, after they’ve finished being weaned for a couple of weeks and have transitioned to a dry food diet. However, once your Great Pyr is in your hands, you have to pay close attention to their diet, focusing on a high quality puppy feed to make sure their muscles and skeleton develop properly. Start with a 4-timesdaily dry food regimen for the first couple of months, then move to 3 medium portions per day until your dog is 6 months old. After that, increase your Pyr’s portions and decrease their feedings to 2 a day. At all times, make sure they have plenty of water. As an adult, from 18 months to 8 years of age, just make sure that you feed your dog once a day, using a healthy, big portion of high-quality large adult feed with a lot of water. It’s best to feed your Pyr either in the early morning or late evenings, especially when it gets hot in the summer – they won’t be as interested in eating during the middle of hot days. Dry feed will keep their dental problems to a minimum, but be sure to get their teeth checked twice a year to look for plaque or tartar deposits. As your dog gets on in years, you’ll want to start slowing down their feeding process as they get less active. Luckily, Great Pyrs live longer than a lot of other dogs due to their slower metabolism, often living up to 10 or 12 years. There are plenty of senior formula blends that will help to account for the changing needs of your Great Pyr, decreasing calorie count while maintaining more vitamin and nutrient content to compensate for their slowing systems. Like we said before, the Great Pyrenees is a large, large breed of dog, which means that they need a bit more love and care than you might think. This means getting them a specially formulated large breed brand of dog food. 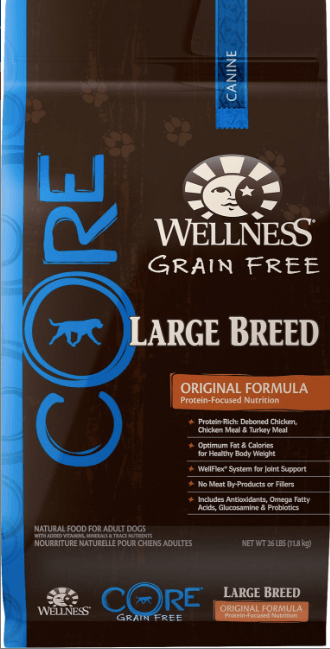 While there are plenty of great dog foods for Great Pyrenees available, we think that Wellness Core’s Large Breed Formula is probably one of the best out there. First and foremost, the vast majority of this particular formula consists of chicken, chicken meal and turkey meal, all lean meat content that should help your Great Pyrenees develop strong muscles and gain a significant amount of animal protein. As for vegetables, peas are a fantastic source of natural fiber and carbohydrates, which should keep your dog in caloric fuel for a while. This particular feed has a fantastic protein-to-fat-to-carb ratio, being roughly equal in all respects (one-third protein, one-third fat, one-third carbs). That said, even this ratio means that your dog will have fewer than average carbs in their diet than other dog foods, which is a good thing. You want high quality meat-based dog food for your Great Pyr, and Wellness Core can provide that for you. 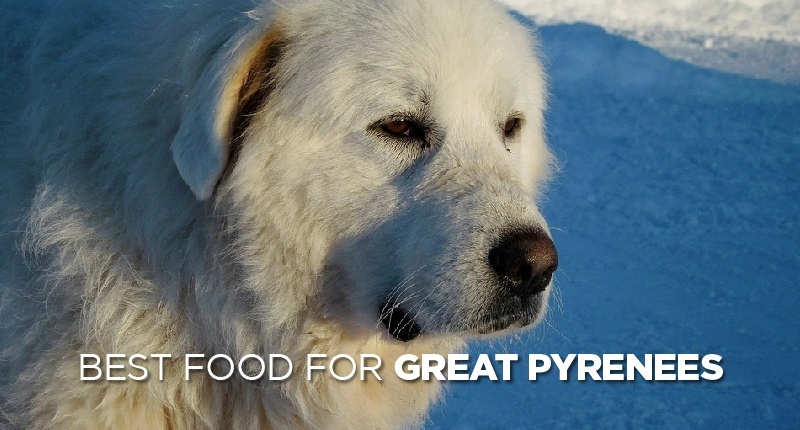 There are quite a few fantastic dog foods for Great Pyrenees out there – this is just the one we thought would fit best for most Pyr owner’s specific needs. However, there’s always more research to be done, so make sure to talk to your veterinarian and do as much homework as you can before deciding on a diet plan for your Great Pyrenees. They’re big, fluffly, lovable dogs, and they deserve all the love and care you can give them! 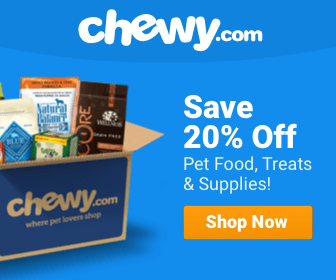 What’s the Best Dog Food for Fox Terriers? Hi! I am a huge fan of Wellness Core’s Large Breed Formula. The Great Pyr I am adopting though is sensitive to chicken, and Wellness Core’s Lamb Formula lacks glucosamine and chondroitin and has chicken fat. Please help.